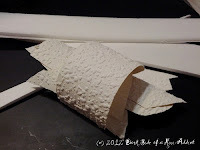 The Dark Side of a Mini Addict: What can you make with foam core and wallpaper? What can you make with foam core and wallpaper? Why a 1 in scale fantasy house for your little faeries, gnomes or whomever would like to move in!! For my cake day my mom and I took a mini class the local mini club offered and was taught by Ron from Ron's miniatures in Orlando. Because the class was one day, Ron had the basic structure built and the inside already wallpapered. The outside was all up to us. So with an extra roll of wallpaper and strips of foam core he set us on our way. 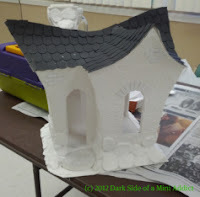 We covered the outside with the paper to give the house more stability and also because its textured it gave the entire house a look of stone/putty. We then cut pieces of foam core to the shapes we wanted to look like flat stones. **Hint if you smush and slightly bend the foam core it will make creases to give the stones a more realistic look. Then we glued them on with the paper side showing. Some foam core has paper covering both sides or you can get it with only paper on one side. If you can see it we also added strips of heavy poster board randomly to give the look of bricks showing through. Then something I had not used before was paintable caulking as the grout, but it worked and by the end of the day most of the areas on my house was dry. I did not paint mine because I wanted to add smaller stones in between but Ron did show us ways we could paint them with watered down paints and a wet rag. Right now the house is just looking at me going...Hello!!! I am not finished...You must work on me this very weekend!! hmm I think i better get more caulking today. Best mini wishes to all. Gracias por todas las ideas, estas haciendo un fantastico trabajo. Oh! This is sooo cute! I love the shape. WOW!!!!!!! This is going to be killer! !